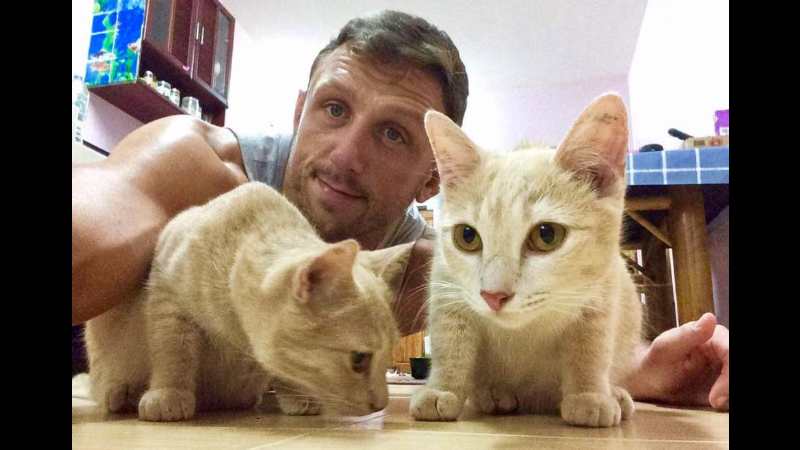 Tiger Muay Thai’s Stuart has given Reece and Asia a ’furever’ home. Whoever it was, it’s clear they never joined a feeding session with Simone Allene, founder of the Rawai Animal Lovers (RAL) community group. It turns out that it’s very much possible to get felines into formation, although ad­mittedly it takes a generous amount of Whiskas and a great deal of dedication. 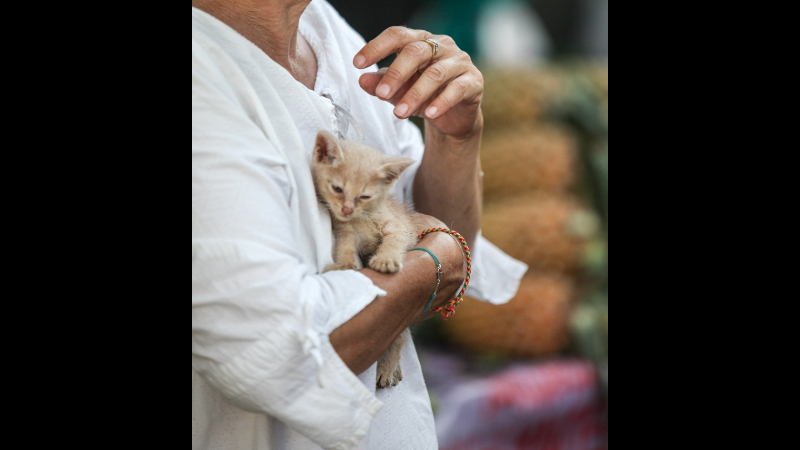 Simone feeds the 100+ cats and 17 dogs in and around Wat Sawang Arom in Rawai daily, and has done since 2005. Her route within the temple grounds, as well as the crematorium, restaurants and locals’ houses on its pe­rimeter, is well known to the felines and canines by now. They linger expectantly at the temple gates, having spent much of the day beating the heat and shel­tering from coachloads of tourists and schoolchildren in the temple’s quiet, shady spots. As I drive through, they throw a few nonchalant, cursory glances my way before returning to the much superior task of self-grooming. With the recog­nisable hum of Simone’s moped, how­ever, furry ears stand to attention, tails wag like windscreen wipers in a heavy storm and she is surrounded. The bags swinging from her bike handles are full of wet food, dry treats and water which she distributes whilst doing a stream-of-consciousness roll call of each diner. There’s Zeus the cat, named for his thunder-grey fur and impressive size. There’s Cleopatra the dog of RAL logo fame. There’s Caleb the kitten who gets a double portion today as she missed the last feeding. And there’s Morgana the cat, who I’m sure we saw two stops back and is sneaking a second course. Simone attributes her remarkable retention for the animals’ names and individual traits to her time as a diving instructor, a job in which paying close attention to the defining features of marine species in order to identify them later was customary. 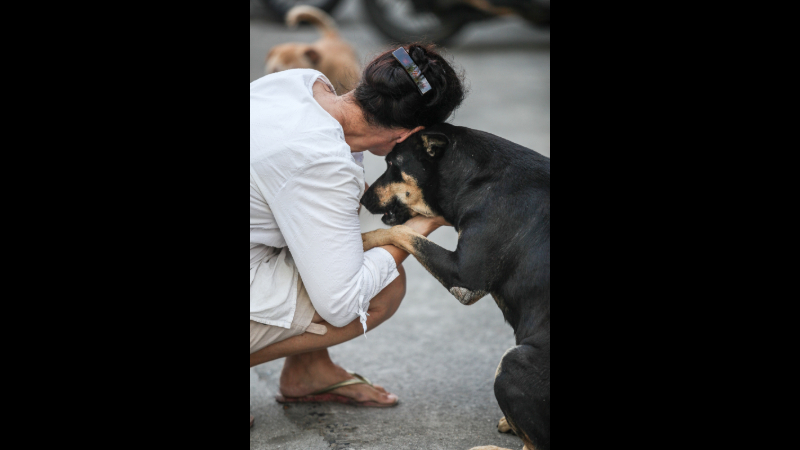 It’s a huge asset to Soi Dog on their weekly visits to the temple as part of their Community Outreach Programme too. Simone can identify changes in behaviour as well as signs of sickness and injury, have them confirmed by the foundation and then administer medica­tion. Furthermore, certain animals have an inherent fear of humans on account of unthinkable abuse and will only be handled by Simone, who has earned their trust over time and with patience. Interestingly, the animals gave to her before she gave to them. In the im­mediate aftermath of the tsunami, Si­mone returned to Phuket having lost a number of friends, and became involved in recovery projects. The temple was a place of solace, and the local dogs would sit alongside her as she processed what had happened. 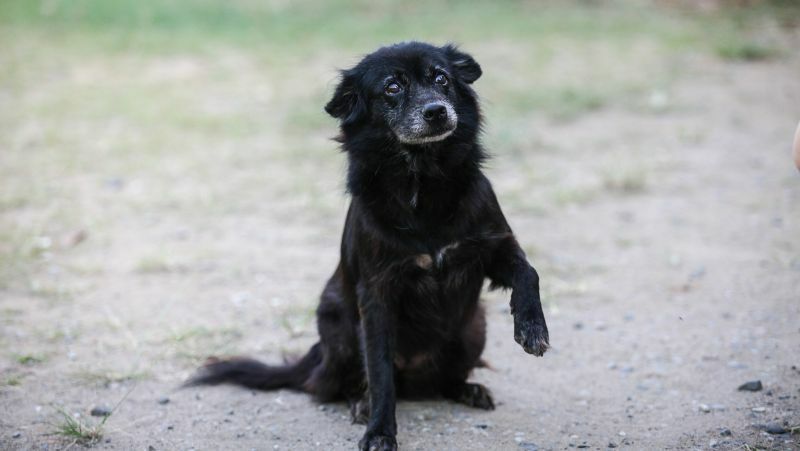 Whilst working on several humani­tarian projects, including the Phuket Sunshine Village, she would return to the temple for the ambience and ani­mals and continue feeding the then resi­dent dogs. And so it began. Simone is keen to challenge certain mentalities and misunderstandings that surround these animals; for exam­ple, that ‘dumping’ a pet at a temple somehow ensures its safety and well-being. While the temple may have been a sanctuary for her, it is by no means so for the animals that have come to call it home. Precious few temples have their own Simone, a fiercely kind, full-time saviour. After feeding the animals for 12 years, and relying on word of mouth to advertise her cause, Simone set up RAL online in early 2017. The Face­book community group is an island-wide space for finding foster and permanent homes for animals (namely mothers and their young), spreading the word about lost animals, exchang­ing tips and advice and even simply sharing a meme or two about the ani­mals the 560+ members joined to help. Thanks to RAL, lost animals have been found, medical care has been provided to animals in need and feeds and steri­lisations have been organised in Rawai. Fellow animal lovers can help Simone by: donating money, food (they love inexpensive tins of BigC Happy Price), litter boxes or cat toys; joining her on a feeding session; temporarily fostering animals; or adopting and giv­ing them a ‘furever’ home. 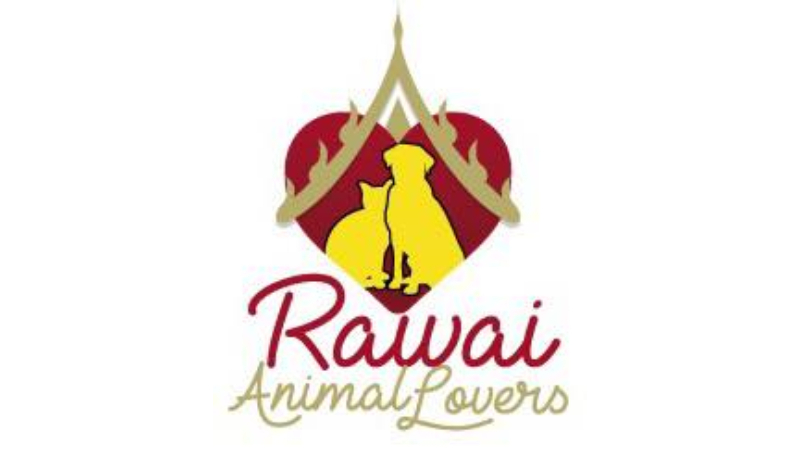 Contact Rawai Animal Lovers via their public Facebook group for further information.